For other uses, see Caraway (disambiguation). 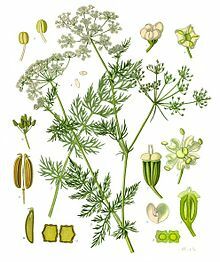 Caraway, also known as meridian fennel and Persian cumin (Carum carvi), is a biennial plant in the family Apiaceae, native to western Asia, Europe, and North Africa. The etymology of caraway is complex and poorly understood. Caraway has been called by many names in different regions, with names deriving from the Latin cuminum (cumin), the Greek karon (again, cumin), which was adapted into Latin as carum (now meaning caraway), and the Sanskrit karavi, sometimes translated as "caraway", but other times understood to mean "fennel". English use of the term caraway dates back to at least 1440, and is considered by Walter William Skeat to be of Arabic origin, though Gernot Katzer believes the Arabic al-karawya كراوية (cf. Spanish alcaravea) to be derived from the Latin carum. S-(+)-carvone is primarily responsible for caraway's distinct odor. The fruits, usually used whole, have a pungent, anise-like flavor and aroma that comes from essential oils, mostly carvone, limonene, and anethole. Caraway is used as a spice in breads, especially rye bread. Caraway is also used in desserts, liquors, casseroles, and other foods. It is also found in European cuisine. For example, it is used in goulash and caraway seed cake. The roots may be cooked as a vegetable like parsnips or carrots. Additionally, the leaves are sometimes consumed as herbs, either raw, dried, or cooked, similar to parsley. In Hungary and Serbia, caraway is commonly sprinkled over home-made salty scones (köményes pogácsa / pogačice s kimom). It is also used to add flavor to cheeses such as bondost, pultost, havarti and Tilsit cheese. Scandinavian Akvavit, including Icelandic Brennivin, and several liqueurs are made with caraway. In Middle Eastern cuisine, caraway pudding, called meghli, is a popular dessert during Ramadan. It is typically made and served in the Levant area in winter and on the occasion of having a new baby. Caraway is also added to flavor harissa, a North African chili pepper paste. In Aleppian Syrian cuisine it is used to make the sweet scones named keleacha. In the United States, the most common use of caraway is whole as an addition to rye bread – often called seeded rye or Jewish rye bread. Caraway fruits are frequently used in Irish soda bread, along with raisins and currants. Caraway is distributed throughout practically all of Europe except the Mediterranean region; it is widely established as a cultivated plant. All other European species of Carum generally have smaller fruits; some grow on rocks in the mountains, chiefly in the Balkans, Italian Alps and Apennines. However the only one that is cultivated is Carum carvi, its fruits being used in many ways in cooking and its essential oils in the preparation of certain medicines and liqueurs. The plant prefers warm, sunny locations and well-drained soil rich in organic matter. In warmer regions, it is planted in the winter as an annual. In temperate climates, it is planted as a summer annual or biennial. However, a polyploid variant (with four haploid sets=4n) of this plant was found to be perennial. Finland supplies about 28% (2011) of the world's caraway production. Caraway cultivation is well suited to the Finnish climate and latitudes, which ensure long hours of sunlight in the summer. This results in fruits that contain higher levels of essential oils than those produced in other main growing areas which include Canada, the Netherlands, Egypt, and central Europe. ^ a b c "Caraway". About.com. Retrieved February 16, 2016. ^ "Anise Seed Substitute". Buzzle.com. Retrieved February 16, 2016. ^ "English Malayalam Spice Names". Recipes.malayali.me. 2008-11-07. Retrieved 2013-01-25. ^ "Caraway". Word Crops Database. Retrieved February 16, 2016. ^ "Chemical Composition and Antiulcerogenic Activity of the Volatile Oil from Carum Carvi". Archived from the original on 2014-03-04. ^ María D. López; María J. Jordán; María J. Pascual-Villalobo (2008). "Toxic compounds in essential oils of coriander, caraway and basil active against stored rice pests". Journal of Stored Products Research. 44 (3): 273–278. doi:10.1016/j.jspr.2008.02.005. ^ Tomanová, Eliška (1998). Wild Flowers. Prague, Czech Republic: Aventinum Nakladatelství. p. 113. ISBN 978-1-84067-046-2. ^ "Finland a Global Leader in Caraway Exports". Archived from the original on April 19, 2014. Retrieved April 19, 2014. Wikimedia Commons has media related to Carum carvi. Wikisource has the text of the 1911 Encyclopædia Britannica article Caraway.